Samsung has responded to the CNET article, saying the quote was misconstrued. You can read the company's new response here. A Samsung executive has admitted that the company is struggling in the tablet market. Talking at Mobile World Congress this week, Hankil Yoon, a Samsung product strategy executive said: "honestly, we're not doing very well in the tablet market." However, it wasn't all doom and gloom from Yoon. He emphasised that Samsung is confident of the success of the Galaxy Note smartphone. The 5-inch pocket-stretcher is being referred to by Samsung as a phone-tablet hybrid, or "phablet", and the company expects to move 10 million of them. A 10.1-inch Galaxy Note variation was launched earlier this week, and Samsung is promoting the included S-pen accessory as a tool that makes creating content – rather than just consuming it – easier. Yoon was unconcerned with the Galaxy Note 10.1 tablet cutting into the Galaxy Tab 10.1's market share, saying: "the best thing to survive in the market is to kill your products. We want to stay competitive in the market." He went on to assert that consumers will get used to the Galaxy Note's unusually large size, and that it occupies a new space in the phone market. 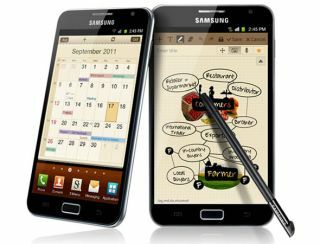 "Once I used this, the Galaxy S II looks too small – I don't go back to any other smartphone or tablet. "Even if the design is similar, how you use the (Note) is totally different."